The Iphone has Siri and for Windows Phone users they have Cortana, both applications can work as our personal assistant. Aside from assisting us in setting our alarm, sending an sms, or reminding us of the next important occasion; Siri and Cortana can also search the internet to provide valuable information for us like finding a restaurant or pulling up the stats of our favorite basketball player. Now here’s another girl who's capabilities are way beyond than Siri and Cortana, meet Amelia a smart blonde girl, who works like a virtual employee she can reply to e-mail, answer phone calls, and she’s also intelligent enough to act like a human. The question is can she replace call center employees? To answer that let’s take a closer look at Amelia’s feature and how she resolves a problem. So How Does Amelia Work? Based on the info graphic above she works like a typical call center employee since she listens, understand and clarifies then executes a process to solve the issue just like following a decision tree or knowledge base article. If you’re a Tier II employee or an employee that resolves escalated issues, you may also hear from her because if she can’t resolve an issue she will escalate it to you. Now here’s the catch once she learns everything from you, your current position might not be safe as well so you are good to go. Would She Find Her Way in the BPO Industry? According to Accenture’s News Release the company is undertaking pilot projects for two clients to implement Amelia in operations. 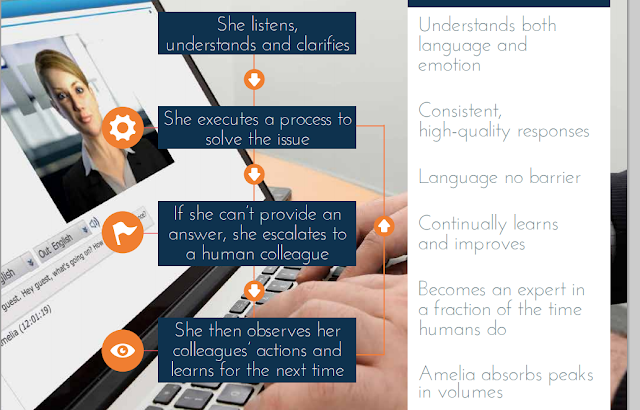 I think once Amelia has been fully implemented in the BPO Industry some call center employees can now focus on handling more complex accounts because, we can say goodbye to accounts with repetitive tasks wherein the number of calls could go as high as 60 or more per day (don’t know the exact figure however there are accounts where an AHT could be 5 minutes or less?). Aside from that, we won’t be a labeled as people who read scripts since we would be tasked to do more complex jobs. Some of us are accountants, payroll experts, tax and legal analyst which could mean higher pay. With the recent fraud issues involving call center employees from different parts of the world we might be giving Amelia a chance to take our jobs. She doesn't even complain if it’s queuing or not, she would happily work even if it’s raining cats and dogs outside, she won’t be affected by natural disaster as long as she’s up she would be willing to answer calls and emails. So what do you think about Amelia’s future would she fly on her own and start taking our jobs as soon as she learns from us or would she have the same fate like Amelia Earhart the female aviator who suddenly disappeared in the thin air?